In many businesses there needs to be a way to track not on the quantity of an item, but also the quantity of an identifiable sub-section within the item. Take for example a buyer and seller of modems. The modem has a model # (in All Orders the Item name of number) but each modem also has a serial #. Creating a new item for each serial # is unworkable. All Orders deals with this by allowing an item to be lotted or serialized whereby each serial # within the Item is tracked as though it were a separate item. 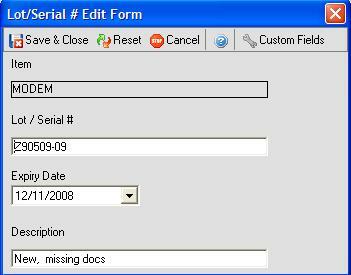 You make an item lotted or serialized by CHECKING 'this item has lots or serial number' in the 'Other' tab of the Item editor. If you have existing quantity of the Item when you bring it in from QuickBooks, All Orders will prompt you to add the lot or serial #s.
Click on the column called Lot / Serial Number and enter the number then tab and enter the Quantity, Expiration date, comment and custom fields. Repeat until all the lot and serial numbers are entered then click Save & Close. Thereafter on every transaction when this item is added you will see the same screen so you can enter you lot #. If you are transactions that are consuming lot or serial numbers then you can use the 'Get Available' button to select them from inventory. If you are transactions that is adding quantities you will see additional buttons on the toolbar. Use Get Next # when you are generating your own # and want to retrieve the next one in sequence. Use Auto # after you need to generate multiple numbers in sequential order. You can view the available lot or serial numbers for an item from its Item Info - Lot / Serial # tab. When you double click a particular # the Lot / Serial # Edit dialog box will show. From here you can change the details of the # including the number itself.